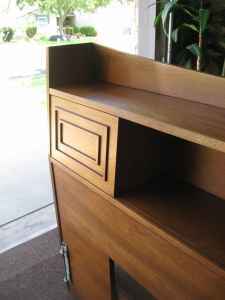 I'll finish up my collection of midwest mid-century treasures, but this intermission is brought on by the fact that a king-size vintage Broyhill Sculptra headboard came up for sale on Austin's craigslist. It looks to be in pretty good condition for vintage furniture. Very nice...I love bookcase headboards like that. I had one when I was a kid. Agree. I love a headboard that can hold the book your reading, a reading lamp and most anything else you'd want before drifting off to sleep. I wasn't the one selling it, but it looks like the craigslist ad has been deleted, so my guess is that it's no longer available. 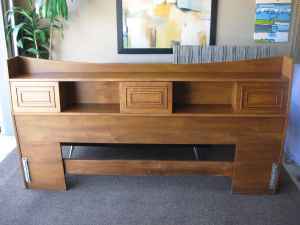 I do try to write about all the Broyhill Sculptra items for sale in Austin that I see though, so if you keep reading another one might pop up on the site.